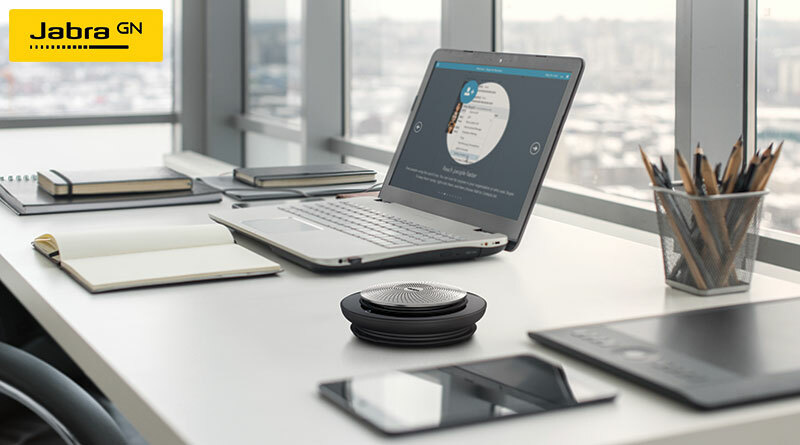 Jabra Speak 710 is more than a speakerphone. It’s a different kind of business device: beautiful to look at, simple to use, something you wouldn’t be ashamed to put on a table at home. 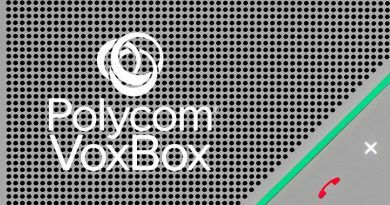 When people think enterprise design, they think of practicality and functionality in a drab box. Maybe a bit finicky to work with, but it has the specs and it’ll get the job done. The Danish company brings a simple, Scandinavian aesthetic. Seen head on, the Speak 710 looks something like a high-end car tire, with the speaker holes arranged in a dynamic, curving fashion. The controls are located in the glossy black portion of the device. The buttons are capacitive, so they respond to presence and touch. They light up as your hand nears the device with clear LEDs and clear symbols. 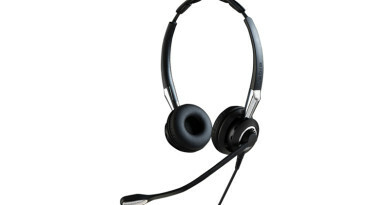 In short, it’s a pleasure to use the Jabra Speak 710. And we haven’t even talked about specs yet! 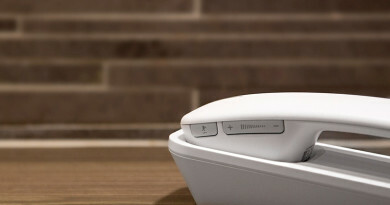 Jabra Speak 710 is a plug-and-play speakerphone. 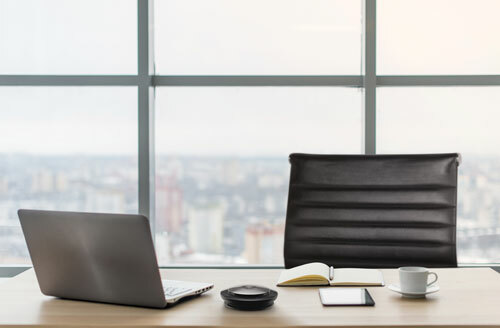 Jabra has worked closely with the leading business communications companies, so the Speak 710 is certified for use with Avaya, Cisco, and Skype for Business. 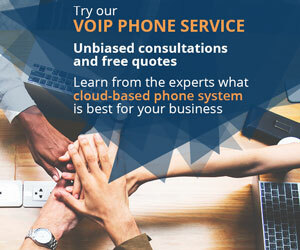 It’s compatible with a huge range of unified communications platforms, including Fuze, Adobe Connect, ClickMeeting, WebEx, Google Hangouts and many more. If you use personal digital assistants, the Speak 710 is compatible with Siri, Microsoft Cortana, and Google Now. You can use it as a speaker and microphone for voice-controlled actions. It also has wideband audio quality good enough for music. Now, this might sound like damning with faint praise, but think about it this way: would you ever put on Spotify with your desk phone? No, of course not. The Speak 710 has incredible sound, considering it fits in your hand. It produces double the volume of the Speak 510. It works just as well for Spotify as it does for Skype. And it has an internal omnidirectional microphone that’s powerful enough to pick up six voices at once. What’s better, with one tap you can pair two Speak 710s to give yourself stereo sound or extend the microphone range to pick up more voices. Let’s take a closer look at those controls. The outer edge of the Speak 710 is glossy black. When at rest, it appears to just have one button: power. Move your hand near, though, and nine more icons appear. These capacitive buttons include the standards: mute, call answer, call end, volume up, volume down, battery, and Bluetooth. There are, however, two more. The symbol that looks like a capital-V tilted to the left puts the Speak 710 in a mode to be used for personal digital assistants like Siri. One tap, that’s it. The symbol that looks like two interlaced rings is a one-tap solution for pairing Speak 710 units. One tap, and you have two speakers or two microphones. It’s incredibly simple to use. The Speak 710 is also incredibly simple to connect. Bluetooth works as it always does, and gives you a wireless wander range of 30 ft. It’s reliable, well-tested. The Speak 710 uses Bluetooth 4.2 Low Energy with a Class 1 core, giving you extra battery life while keeping a reliable connection. 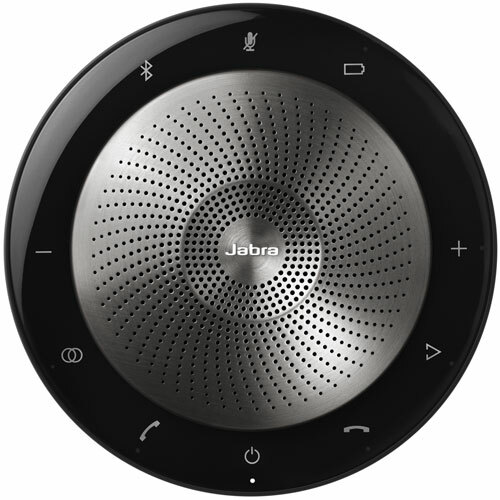 The 710 also includes a Jabra Link 370 wireless dongle, which fits neatly into the bottom of the unit. This is a little USB plug, like you’d use for a wireless mouse. Highly reliable and effortless to use, it gives you a wander range of 100 ft.
Or you can just plug in the USB cable. The phone itself is something like a spool, with the USB cable neatly housed and wrapped around it: there if you need it, neatly out of sight if you don’t. The details of design make all the difference. All these options make the Speak 710 very easy to connect no matter where you are. The final feature we want to highlight is the Speak 710’s portability. 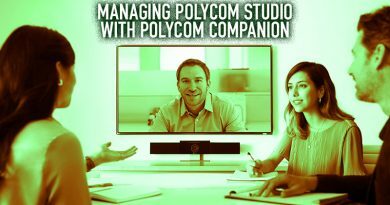 More and more conferences are taking place remotely. 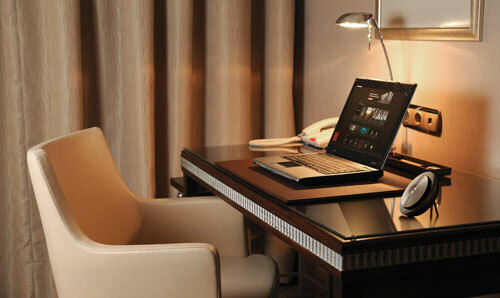 You might need to hold a business call in your hotel room. You still want professional sound, right? The Speak 710 is there for you. 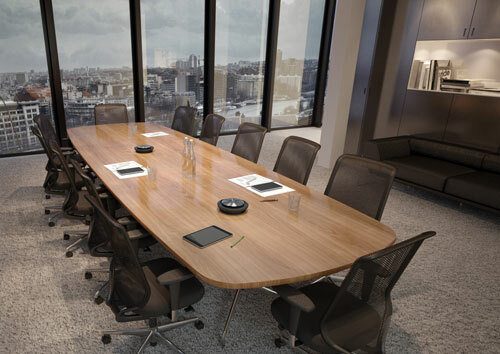 You might want to hold an impromptu conference call. You only have a spare office available, and it’s not set up for calls. The Speak 710 is there for you and your group. Even though it weighs just 298 grams, the Speak 710 gives you 15 hours of battery life with a full recharge in only 3 hours. It comes with a carrying pouch. does it work with mobile whatsapp calls? Yes, it should work for WhatsApp as a Bluetooth speakerphone.